Join the discussion on our forums! Come discuss Dendrologist over in our dedicated Dendrologist discussion topic. Battlecry: If you control a Treant, Discover a spell. He's teaching his little buddy to talk, but all it says is, "I am Gloop." Not a build-around-me card, not terrible either. A solid1-of in Standard Treants. decent stats with a huge upside. Problem is this card needs more support and for treant druid to be a better deck. Like I think they just need to print a 1 mana 2/2 treant card and the deck will really start coming together. Turn 1 treant, turn 2 this guy, turn 3 double treat, turn 4 wispering woods, turn 5 soul of the forest, then you start dropping rushing 8/8's for free. Also need a good treant buff payoff card like 3 mana give your treants + 2/2 or something like that. I don't know how discovering a spell is such a huge upside. That's not exactly how I would have described any of the other 2-mana drop a thingy cards for other classes. This one is actually worse if you don't have the turn 1 treant compared to what other classes get. And what are the odds you are going to get one of your turn 4 or 5 plays in your discover? Probably not going to use that spell for awhile. So yeah, I don't think it's that good. I think this card is better than people are giving it credit for. A vanilla 2/3 on turn 2 is fine. It's ok to waste the battlecry there. It's also fine if it's later in the game and you happen to draw it. Assuming you have treants, which seems like it'll be a theme this expansion, so I'm not worried. "- Hey guys, check out my treant, he can talk!!!" Treant : "- I am Groot"
It's like Hydrologist. But instead of Discovering Stampeding Kodo every single time, we're gonna see one of the two cancerous Frozen Throne spells Druid got. XD Bruh, I think you mean Getaway Kodo. 1. That is a valid point, however not all of the cards for the set has been revealed yet so we may see more Treant cards. Also, while playing on curve is important Druids have the potential to snowball with extra mana crystals so playing this card and getting a Treant doesn't sound too difficult. 2. Getting this card out later isn't too big of a deal because some of Druids most useful spells have a higher mana cost (Ultimate Infestation, Spreading Plague, Starfall, Nourish, Branching Paths, etc.) so getting those spells earlier makes it basically a dead card in your hand. 3. If you're looking for armor in a token deck Ferocious Howl might be a better card because then you can keep your hand filled and gain more armor. your thinking too much of arcanologist which you would play on curve for stats and to remove potentially bad draws from your deck and move them to your hand this more like hydrologist where you you play it when you can actually cast the spell. You wouldnt want to discover an answer when its turn two and you have no idea what the question is. On turn 10 though suddenly your finding a starfall that opens you up to a full clear or your drawing it off the top after being forced to cast deathwing and you see UI you just when back into a game that wouldve ended based on whether or not your opponent could kill deathwing. This is not something you want to play t2 unless your in a match where a 2/3 t2 is better then a late game spell. Also its druid everyone knows T2 is wild growth pass. 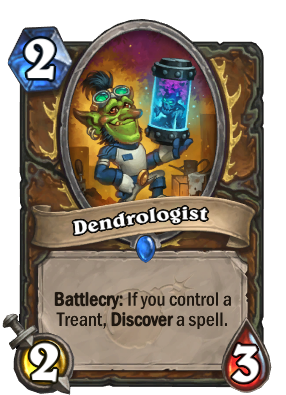 This card along with the other 2 Druid cards revealed today will push the limits of Token Druid (not to mention it is already a Tier 1 deck). Looks like Druids won't be going anywhere after Witchwood. So, is treant going to be a new tribal tag they're adding to old cards as well? This is the kind of card that could make Hand Druid a thing. Potentially broken cause of insane druid spells. The card is great value but it seems a little overkill to play cards like force of nature to discover a random spell.